Collaborations in the brewing world, especially between microbreweries, have become part of the loving, warm-hearted soul of this industry. It’s a curious thing really, for businesses in the food and beverage industry to collaborate in this way. We might expect it of celebrity chefs, or niche, independent delis and producers, but it hardly occurs elsewhere in food and drink. In the arts, you can’t move for collaborations between musicians, artists and authors. Sometimes, beer and art cross over. Rapper Professor Green launched his own beer (brewed by Titanic) called Professor Green’s Remedy, and Beck’s have been using artfully-inspired labels created by artists and bands for a few years now. Even Elbow have released a ‘build a rocket boys!’ beer with the helps of Robinsons. It’s a question that is barely worth asking, really. Why beer? Beer promotes collaboration because it’s one of the great social levellers, the great equaliser between ages, cultures and ideologies that promotes understanding and friendship (although, past a certain point, some people become progressively less understandable and friendly). Sharing, caring and so on are all very well and good, but how about a little competition to spice things up? 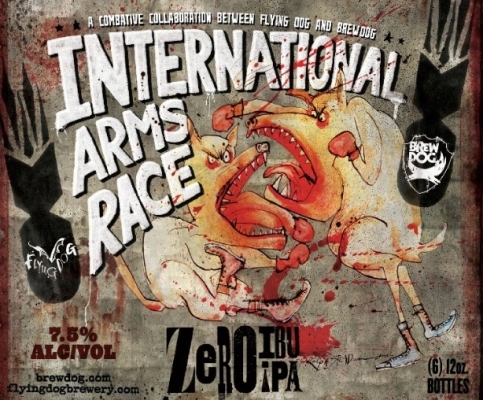 On Monday, I attended the climactic final part of the recent International Arms Race between BrewDog and Flying Dog to create a winning Zero IBU IPA using no hops. It was a fascinating concept, and one that was wisely chosen. After all, instructing two hop-loving breweries to create a superior IPA would simply result in each producing a nuclear-hopped, scorched-earth-bitterness monster, which either could easily do any day of the week. Specifying that no hops could be used levelled the playing field and instead encouraged innovation. After agreeing on a set list of ingredients used to create spicy bitterness instead of hops (including bay leaves, ginger, rosemary and all sorts of herbs and spices), each brewer went off to create very different beers. I will review each of them properly in a future issue of Rum and Reviews Magazine (once I have received some bottled versions), but the beers couldn’t have been more different, and the event held at BrewDog Camden was a great evening of beery nerdiness. It may have been a ‘Combative Collaboration’ and a competitive one, but both brewers gained from it, and had a lot of fun doing it. The competitive element intrigued me, because we are so used to the likes of Mikkeller simply co-authoring something with every brewery under the sun. Bloggers, writers, anyone can get involved, and that’s great. However, I think the competitive element adds something exciting. It encourages creativity and pushing boundaries, and I think a lot could be done in this regard with food. Imagine, instead of trying to make the best Beer X, why not try to make the best beer to go with Food X? The ultimate steak, BBQ or burger beer. The ultimate curry beer. The ultimate dessert beer. 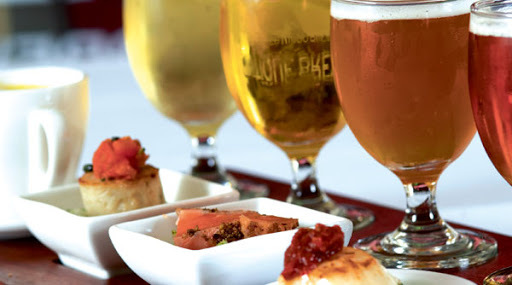 A famous chef could define and create the exact dish that the beer must match to, and then brewers could be invited to compete for the accolade of having the best beer to go with it. It’s something that drinkers and bloggers give their opinion on all the time (“for me, if I’m having a curry, I absolutely must have a … to go with it,”) and it would force brewers to put their pride on the line, instead of just idly suggesting an easy food match on the back of the bottle. What do you think? Are collaborations a Good Thing? Would you like to see more competitions? I’d like to know your thoughts. Previous Previous post: "It’s all just a bit of harmless fun."